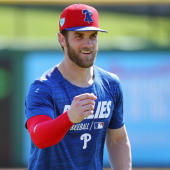 The 2019 MLB season is rolling along and Fantasy baseball owners everywhere are working hard to navigate the difficulties of April, when roster manipulation, injuries and the weather all can make filling out your lineup a challenge. Rookies like Pete Alonso of the Mets and Victor Robles of the Nationals are already rising up the 2019 Fantasy baseball rankings and establishing themselves as stars. Meanwhile, Khris Davis of the Athletics already has a staggering 10 home runs and Jose Altuve has gone yard in five straight. Your Week 4 lineups will likely be defined by the tricky start-sit decisions and Fantasy baseball waiver wire moves you make. So, make sure to see the Week 4 Fantasy baseball rankings from the proven computer model at SportsLine before you set your lineups. Last week, the model was high on Athletics SS Marcus Semien. The result: Semien recorded seven hits, six runs scored, 5 RBIs and two homers in the four-game series against the Orioles. Anybody who had him in their lineup was well on their way to a huge week. Now the model, which simulates every pitch and every at-bat 10,000 times, has set its sights on MLB picks and revealed its optimal Fantasy baseball rankings for the week of April 15-21. One player the model is high on this week: White Sox rookie outfielder Eloy Jimenez. The 22-year-old entered the season as the No. 3 MLB prospect, and after hitting just seven singles in his first 34 plate appearances, he's starting to show the hitting skills and sky-high power that made him such a big-time prospect to begin with. Jimenez has eight hits in his last 19 trips to the dish, including his first two home runs against the Yankees on Friday. His average is up to .300 now and SportsLine projects him to finish as the No. 8 Fantasy outfielder in Week 4 despite the fact that he's being started in just 62 percent of CBS Sports leagues. Get him in your lineups while he's still climbing the 2019 Fantasy baseball rankings. And a massive shocker: Rockies outfielder Charlie Blackmon, the fourth-best player at his position according to market value, stumbles this week and finishes well outside the top 25. Blackmon enters the weekend having failed to record a hit in five of his last eight games and has recorded just one RBI in his last nine. He's a player to consider putting on the bench. The model is also calling for a surprising shortstop you aren't even thinking about to finish in the top five of its Week 4 Fantasy baseball rankings. This pick could be the difference between winning big and going home with nothing. So who should you sit and start this week? Visit SportsLine now to get Week 4 Fantasy baseball rankings for every position, plus see which shortstop is going to come out of nowhere to crack the top five, all from the model that out-performed experts in football big time last season, and find out.